Wonderful collaboration on this with kindred spirit Erica Sidel who runs The Connective Good, a boutique executive search practice with a focus on marketing, marketing analytics, and marketing technology. Looking for your next marketing career adventure? Or looking to hire the best marketer? We interviewed thousands of modern B2B marketers. From their responses, we observed some behaviors that separate the standouts—those who receive multiple job offers—from the strikeouts—those who linger in job transition limbo. How many of the following nine standout traits do you have? How many of the strikeout sins are you committing? Standouts describe what they do and what value they deliver succinctly, using metaphors, narratives, and vivid language. An example: David Karp could simply say he’s a B2B marketing consultant. But he doesn’t. Instead, he says he’s “a marketing plumber, helping to clean up dirty import files, refurbish rusty Salesforce setups, seal your leaks, run CRM crime scene investigations, and keep leads flowing smoothly.” Then he produces a miniature toilet plunger, slapping it onto his business card with a flourish. Standout? Check. Too many marketers strike out by introducing themselves with a long-form recitation of their career story rather than getting to the “what’s in it for the listener” stage. When you explain your value so people “just get it,” they imagine you in action and see how to connect you to others who need you. Your narrative could be about your career path, or it could be about a product or service you have marketed. For example, where might have you delivered a story or narrative that created a movement, accelerated sales, or opened up new pipeline opportunities? Standouts know that the people they meet will remember one or, at most, two things about them. So they plant “triggers,” such as, “When you hear that someone at a growing SaaS company needs a demand gen leader, think of me.” Standouts get others to articulate their job search needs succinctly. Strikeouts bombard listeners with a meandering litany of permutations that they are considering for their next career step. And the people they meet remember none of it. Strikeouts have a hard time telling the difference between a recruiter, a career coach, and a therapist, unloading to a recruiter or hiring manager what may be better suited for the couch at the therapist’s office. If you aren’t yet clear on your desired direction, invest in a career coach before starting your networking in earnest. Standouts approach each networking meeting as an opportunity to give, not just take. When you meet people who could advance your search, always ask how you can be helpful to them. Better yet, anticipate their needs, and offer your help proactively. Introduce them to someone, or send them a relevant article. Strikeouts tend to be net takers. It just doesn’t occur to them that they could give back to the people who are devoting time to helping them. Very few marketers follow up with people who have helped them in their career transitions. The bar is low here, and you can easily differentiate yourself. Although the first time you meet someone may not bear immediate fruit, you will build familiarity and trust over time by staying in touch. Strikeouts miss out on this opportunity and see their networking as one and done. So they don’t reap the multiplicative effects down the line. Many of today’s top marketers have career paths with zigs and zags. Standouts integrate those diverse experiences into their stories. Maybe you were a drummer in a band after college. You realize that your drumming experience helps you stay in sync with others—a key skill for a marketer. Wonderful! Now you’ve integrated your story, rather than leaving your audience puzzling over how to connect the dots. And you’ve differentiated yourself from people who have done marketing for their whole career. Strikeouts miss opportunities to weave their experiences into their value proposition. Maybe they were lifeguards or engineers, but they come off as less experienced marketers rather than enhanced marketers. Curiosity is critical in a field that is changing as quickly as marketing. Standouts are naturally inquisitive, and it shows. Do you research a company fully before interviewing? Talk to its customers, read the blog, map out its competitive set, sign up for its newsletter, and test drive its product? Then do you come up with questions that demonstrate your understanding? That’s what a standout does. Strikeouts ask questions that could be answered with a simple Google search. Or they don’t have questions at all. Standouts enter an interview with work samples, and sometimes they have a plan of how they’d tackle the job. They ask tough questions, approaching their interviews like peer-to-peer dialogues. Strikeouts wait for the interviewer to pepper them with questions that they “fend off.” As a result, rather than engaging in a peer-to-peer style of conversation, they fall into more of a one-up/one-down conversation. Which sounds better: “I built the core positioning and messaging,” or “I built the core messaging that positioned the company as the leader in the customer journey analytics space, and with the new positioning, leads tripled and revenue doubled”? Standout B2B marketers are aware of their audience. Accordingly, they know which metrics to use when talking to a CEO versus, say, a head of Sales or a manager of demand generation. The CEO cares about revenue, churn, customer growth, and customer satisfaction more so than marketing metrics such as CTRs and brand impressions. 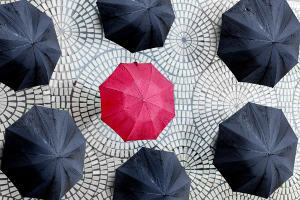 Standout marketers can demonstrate their empathy for what their audience cares about, and they build a distinct connection with their interviewer. Strikeout marketers are more likely to stay within the marketing swim lane as they describe their work. They don’t realize that speaking with a CEO is different from speaking with another marketer. Standouts paint a picture about their next career adventure and why they are excited about a particular company or role. And they describe their ideal cultural fit accurately. Swapping your strikeout traits for standout skills could be the difference between a hiring process that lasts months with lots of competition, and a matchmaking experience that is quick and engaging. Be prepared, differentiated, authentic, and curious. Be a standout.